The Grove GMK4090 all-terrain crane ... best in class. Manitowoc unveiled some class-leading Grove crane models at its recent Crane Days 2018 event, including one that offers the longest reach and highest capacity of any model in its rough-terrain line-up, and a lightweight truck crane that can quickly travel between job sites. The Grove GRT9165 is the latest in its line of class-leading rough-terrain cranes with a host of features that will help companies increase efficiency while maintaining a low total cost of ownership. The new crane made its debut at Manitowoc’s Crane Days event in Shady Grove, Pennsylvania, the US. 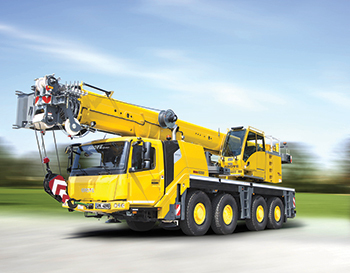 The GRT9165 is a 149-tonne-capacity crane that features a 62.5-m six-section, pinned boom. In fact, the boom is 1.5 m longer than the closest competing model, according to a Manitowoc spokesman. The tip height maxes out at 91.2 m, and both manual and hydraulic extensions are available. The Grove GRT9165 by Manitowoc ... the latest in its line of rough-terrain cranes. The GRT9165 has been designed for easy transport, with a compact overall height of 3.8 m. It also has hydraulically removable counterweight and outrigger boxes, in addition to a hydro-gas suspension on the rear axle. With all components removed, the GRT9165 weighs in at an easily roadable gross vehicle weight of approximately 52,617 kg. Paul Cutchall, product manager for rough-terrain cranes at Manitowoc, says the GRT9165 represents the latest advances in Grove technology, including features that have been developed specifically in response to customer demand. “The GRT9165 continues our trend of offering class-leading advantages on large capacity cranes. The crane’s longer reach, in particular, will help lifters to bid for and complete more jobs with a single crane, increasing their capabilities,” he remarks. Manitowoc used extensive Voice of Customer (VOC) research in the design process for the GRT9165, which involved in-depth discussions with dealers and customers. The model also benefitted from rigorous testing at Manitowoc’s Product Verification Center (PVC) in Shady Grove, where components are tested well beyond their lifecycle to ensure quality and durability. Keeping operator comfort and convenience in mind, the GRT9165’s updated cab features a new wide-body design, and an optimised Crane Control System (CCS) viewing screen. The cab can also hydraulically tilt up to 20 degrees, providing improved visibility for the operator. Also debuting at the Crane Days event was the best-in-class Grove GMK4090 all-terrain crane featuring a modern, compact design that puts an emphasis on roadability and manoeuvrability. 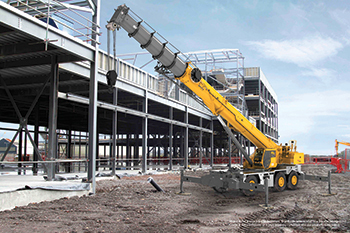 The 90-tonne taxi crane offers a 51-m, six-section Megaform boom that utilises Grove’s Twin-Lock pinning system. Boosting its overall reach is a 15-m bi-fold swing-away jib that can be extended with a 6-m boom extension for a total jib length of 21 m.
It can travel with a maximum 18.3 tonnes of counterweight, and within 12 tonnes per axle, it can transport up to 9.1 tonnes to the job site without the need for an additional transport truck. This feature enables high capacity while keeping transport costs low. The crane features compact dimensions, with a narrow width of 2.55 m, so it can easily access and manoeuvre within the tightest of job sites. It has a minimum tail swing of only 3.5 m, so it stays within the maximum outrigger width, unlike other cranes in this segment that require extended tail-swing clearance, says the spokesman. The GMK4090 also offers the new MAXbase feature as an option; this variable outrigger setting gives the crane more set-up flexibility on the job site, especially when erecting it on irregular job site grounds. Also unveiled at the Crane Days 2018 event was the Grove TMS500-2 truck. The 36-tonne capacity model features quick set-up and versatile taxi capabilities expected from a truck crane in this class. The TMS500-2 will have two boom options. The first ranges from 8.8 to 29 m, with three quick-reeve Nylatron sheaves in its main boom nose. The second option ranges from 9.8 to 31.0 m and has four quick-reeve Nylatron sheaves. Both four-section booms are synchronised and full-power, making this crane easy to set up and quick on the job. It can also be equipped with an optional 7.9 to 13.7 m telescoping swingaway jib for additional reach. The TMS500-2’s modern, single-person cab comes with an upgraded console with an automotive-style gauge display and multi-function steering, which grants fingertip access to cruise control and driving lights. The crane also features a high-performance 350 hp Cummins ISL engine with an Ultrashift transmission that provides highway travel speeds of up to 113 kmph. The TMS500-2 can be configured with either a heavy or lightweight counterweight package for added versatility when meeting local roading requirements. Whichever package customers choose, the TMS500-2’s load charts provide best-in-class performance, the spokesman claims. Founded in 1902, the Manitowoc Company is a leading global manufacturer of cranes and lifting solutions with manufacturing, distribution, and service facilities in 20 countries. In 2017, Manitowoc’s net sales totalled $1.6 billion, with over half generated outside the US.